We don’t have that many hot days here in the Seattle area. When they come, I relish them, drinking that hot air into my skin as though I’m trying to photosynthesize. The memory of February never leaves me. And when we have fewer 90-degree days than there are fingers on my hand? Well let me tell you, I’m not complaining. A few weeks ago, when the hot air pulsed against the screen windows, Lucy helped me slither mango slices into the blender. She dolloped in yogurt, proudly. I squeezed orange juice as she ran to the garden for a handful of fresh mint. Proudly, she poured in thick honey, the last ingredient on the counter. With a roar of the ice cubes crushing, the blender presented us something perfect for that weather: mango-mint lassis. Thanks to The Sprouted Kitchen: A Tastier Take on Whole Foods , Lucy, Danny, and I drank these glasses filled with cold goodness together on a hot, hot day. I like any book that inspires me to cook, no matter what form it takes. This new cookbook has been making us stand in the kitchen, trying new dishes. The book’s subtitle  A Tastier Take on Whole Foods  made me think about how we eat now. These days, I look in the pantry and find whole grains in jars, several alternative forms of sweeteners besides sugar, at least seven gluten-free flours, shelled nuts, olive oil, anchovies, and dried beans galore. There are very few packaged foods in our pantry. They’re an occasional treat, intended for traveling or truly busy mornings. Whole foods? That’s just called food here. However, before I went gluten-free, I ate plenty of packaged foods. I never really looked at the labels on my food, except to worry about the calories. That last year before I was diagnosed with celiac, I had deli salads, takeout, and tv dinners, all the time. Now, I cannot imagine eating that way. I think the idea of cooking without packages or already-chopped onions frightens a lot of people. What if dinner comes out bland? What if we mess it all up? Eating with whole foods sounds like an earnest hippy endeavor, doesn’t it? If you have good ingredients, and a what-the-hell attitude, you’re bound to have some kind of adventure in the kitchen. And if you have good, solid recipes like the ones in The Sprouted Kitchen: A Tastier Take on Whole Foods , you might find yourself buying fewer and fewer packaged foods at the store. This edamame mash? It’s so good I wanted to eat it for breakfast the morning after we made it. It’s tinged with ginger, singing with the lightness of rice wine vinegar, seasoned with tamari and fish sauce. The sesame oil binds it together and flavors it all with some mild darkness, a bit of a mystery. It’s only six ingredients. They only seem unusual until you start cooking with them. With a bit of practice, you can’t believe how easy good cooking can be. Thanks, Sara and Hugh, for your thoughtful recipes inspired by the seasons and your gorgeous photographs. You’ve got us cooking in this kitchen. You can buy The Sprouted Kitchen: A Tastier Take on Whole Foods here. It looks fancy, doesn’t it? The kind of dish you might make to impress company? What might make you happiest is how little time it takes you to make. Chop up some pistachios, boil some edamame, whirl up a mash in the food processor, and cook the salmon. Dinner’s ready now! Think of this as a template recipe. You could use any firm fish here, if you want. Try walnuts or almonds instead of pistachios. If you can’t find edamame, then fresh peas and lima beans could stand in well. Play. It’s your kitchen. Preparing to cook. Heat the oven to 450°. Making the edamame mash. If your edamame are frozen, boil them until they are tender, about 8 minutes. Drain immediately. 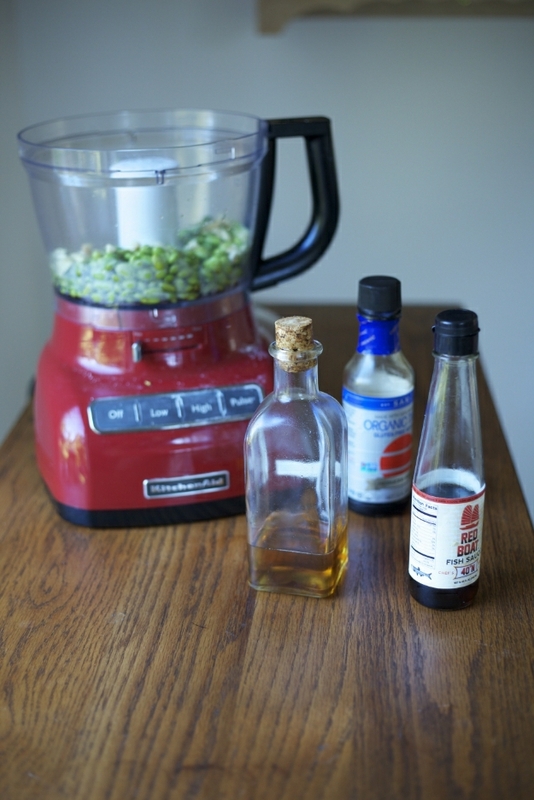 Pour the edamame into the bowl of a food processor. Add the ginger, rice wine vinegar, tamari, and fish sauce. Whirl them all up in the food processor. They will be a pretty chunky puree. With the food processor running, drizzle in the sesame oil until the edamame mash is smooth and holds together well. (If you the hash still needs more liquid, you can add more sesame oil or a bit of water.) 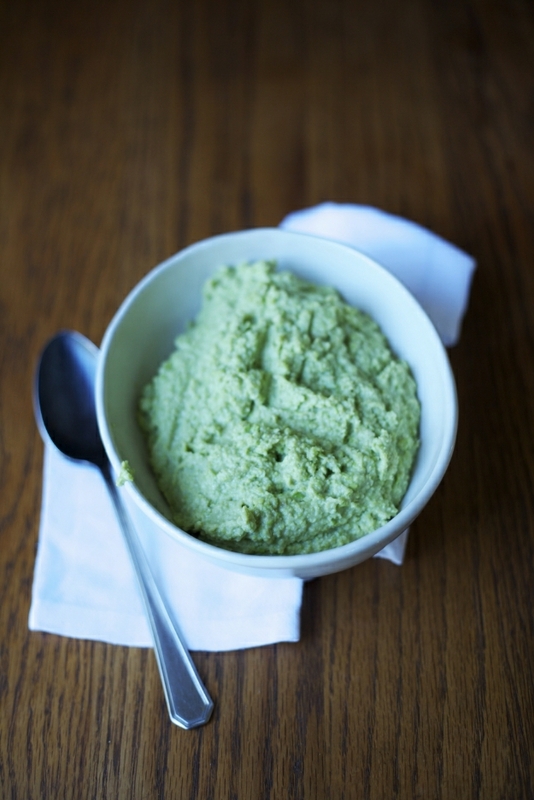 Taste the edamame mash. Season to taste with any of the ingredients you wish. Move the mash to a bowl and cover with plastic wrap or a towel. Chopping the pistachios. After you rinse out the bowl of the food processor, pour in the pistachios. 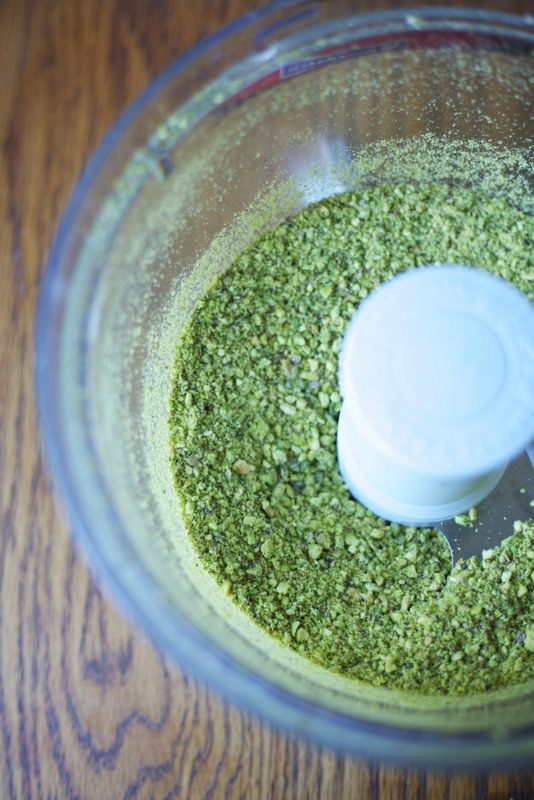 Whirl up the pistachios until they are very finely ground. (See photo above.) Watch out to not grind them too fine. You don’t want pistachio butter. Cooking the salmon. Season the salmon with salt. Put the beaten eggs in a wide bowl, the flour in another, and the ground pistachios in another. Set a large cast-iron skillet on medium-high heat. When the pan is hot, pour in the oil. Working quickly, dip the side of the salmon fillet without skin in the flour, then the beaten eggs, and finally the pistachios. Lay the salmon fillet down in the hot oil. (Be sure the lay the fillet away from you, to avoid splattering yourself with hot oil.) Repeat with the remaining salmon fillets. Dollop some of the edamame mash onto a plate and top with the pistachio salmon. Serve immediately. I just want to begrudgingly thank you for making me want to go out to the store for the ingredients for the edamame mash at 7:30am so I can also have it for breakfast! I make a similar dish using seared scallops! Like you my pantry is jam packed with real food. I am stymied at how much I can actually make myself. I rarely buy something packaged. It used to be a goal, now it is just the way we live, inspired by Paul Bertolli’s Cooking by Hand! I am currently working on being inspired not to waste anything so anyone out there with ideas for the plethora of tomato skins I have collected during my canning season suggest away please! I am over my head in honey, pulling 15 plus gallons of sweet golden nectar so do send that new address dear. My kids often complain we have no food in our cabinets, just ingredients! Which isn’t really true, but most of what we have takes more than 3 minutes in the microwave to prepare. Hi Shauna and Danny! I’m new to your blog, but I’m already in love. Just found out we’ve got a gluten-intolerance in the family and I’m looking at it as an opportunity rather than an affliction! Looking forward to digging into the archives! This looks amazing and I think my picky girl might actually eat the mashed edamame since she recently discovered the joy of whole ones. It’s interesting what you said abou whole foods versus packaged, and the time it can take to change old habits. When my daughter was diagnosed a year ago we ran out and spent a fortune on gf replacement foods – many sat barely touched in our pantry for months. Now our pantry is filled with things like pasta, rice, beans, and of course tons of flour 🙂 though to be honest we also keep a few boxes of Annie’s creamy Mac and cheese for emergency preschooler dinners! so pretty with the green nuts on the green mash! thanks for the kind words. I think we take it for granted that whole foods are just food to us. It seems there is no other way in my opinion, but I work and Trader Joes as well, and am telling you there is still a big disconnect between eating for wellness and just eating to fill up. It’s sad. I’m so grateful and inspired to keep being an advocate for good food! Thanks for all the work you do, shauna! A beautiful looking meal! Whole foods are the way to go indeed, it is strange to sit back and think how the the “everyday foods” we eat are so altered from their origins. Pistachio with edamame sounds pretty good too! This looks delicious. I’m always amazed at how salmon lends itself to combining with so many other interesting flavors — mustard, dill, teriyaki — as well as standing well on its own. I think I’ll add this to my menu for this busy first week back to school and soccer practice. Maybe with a side of quinoa? Thanks again! Just made this last night and served with a roasted beet salad. Delicious!! Thank you! Awesome site! I am just learning about becoming gluten free. There’s lots of good in fo out there so thanks for sharing your site. Oh that looks wonderful! My husband loves pistachios and we happen to have both scallops and salmon in the freezer. Now I need to pick up some edamame and gf fish sauce. I had lost track of how much we cook from scratch until a friend was staying with us for a while. “Most people don’t cook as much as you do, you know.” And another friend who has a shelf with 5 or 6 bottles of spices over the stove. That’s it. We belong to a local CSA and a local organic meat buying club, so whole foods arrive on a regular basis in our house. Have you tried grinding your own flour? We’ve found it is lots cheaper to get whole grains (Sorghum, rice, quinoa, buckwheat, millet, etc) and a nutrimill grinder. We still rely on Bob’s Red Mill for starches, etc. Keep up the good work. Looking forward to the new cookbook when it comes out. Oh wow! The edamame is divine!!! I make an edamame dip that I love to put on crackers…but this is an application I oddly overlooked! What a great idea. And, as you said, such an elegant presentation. Oh, and thank you for your gorgeous words. I could gobble them up all day long. Oh god. One amazing thing covered by another….I must try. This looks like a dish they might serve you in some fancy schmancy restaurant. Can’t wait to try this at home! I served this for a friend with an onion allergy who has been coming over every day to help tile our bathroom. My partner and I have 20 pounds of Lake Michigan salmon in the freezer and needed more recipes than our standard. We served this one up and it was an instant hit! I used toasted sesame oil which was all I had in the pantry and the depth of the flavor was amazing. I’m not sure it’s what you intended but it turned out well none the less. Thanks for another great recipe! This looks the bomb. I love salmon and I’m always looking for new ways to cook it- pistachios is just brilliant. 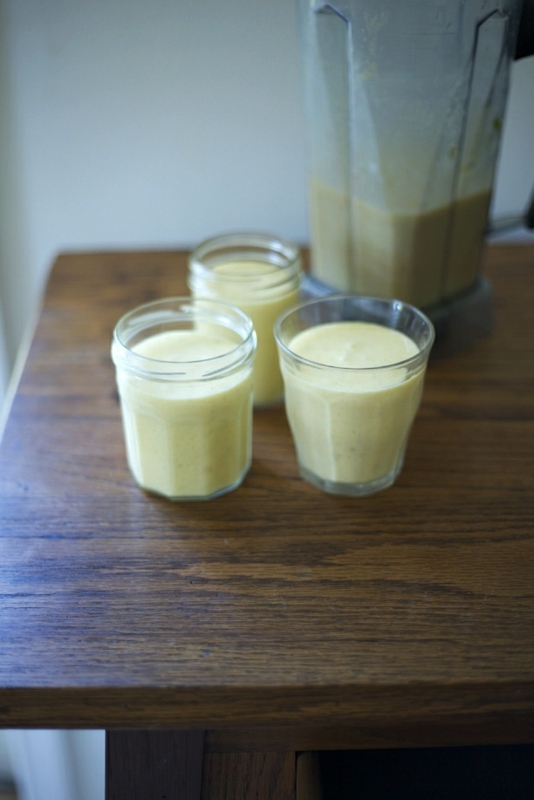 Those mango-mint lassis sound yum too… I just got a blender last week and I am so excited to try new concoctions. We made this tonight and it was delicious! Especially the edamame mash – that stuff is addicting!